If you are one of them, either one iPhone and one Android phone or two iPhones/Android phones, Backuptrans iPhone Android SMS Transfer + must the the best software for managing all your SMS messages smoothly. iPhone Android SMS Transfer + provides all solutions, including iPhone SMS to Android transfer, Android SMS to iPhone transfer, iPhone/Android SMS to computer transfer, restoring SMS from computer to iPhone/Android, and viewing/exporting/printing out SMS on your computer. Backuptrans iPhone Android SMS Transfer + does a great job in transferring SMS between iPhone and Android. Connect both iPhone and Android to computer, and it will help do the left. Also, you can use it to transfer SMS between two iPhones or between two Androids. This is a great helper when you get a new phone. In addition, it makes it easy to transfer and backup your SMS from iPhone/Android to computer where you can view,export or print out your SMS. 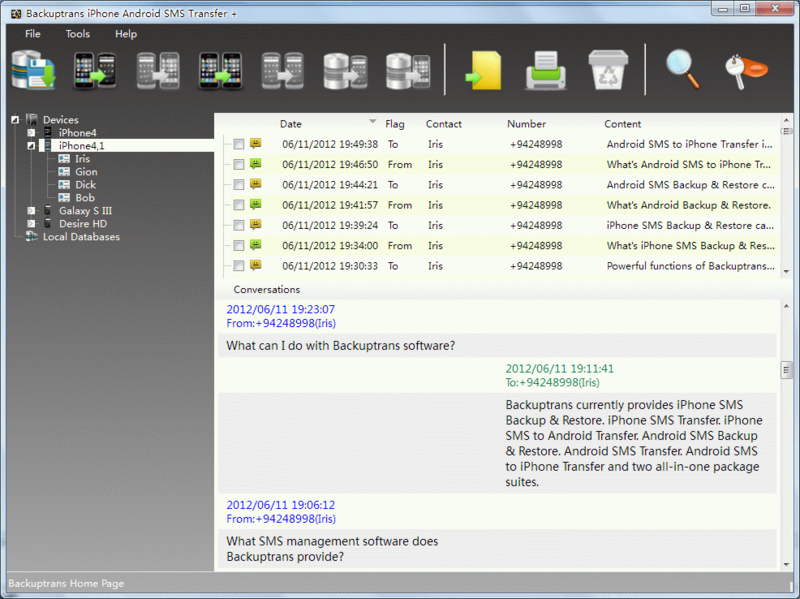 Amazingly, you can easily restore the SMS backup back to your old phone or onto a new iPhone/Android phone. Besides, you can also choose to transfer SMS onto iPhone/Android from iTunes Backup once you backup your iPhone data with your iTunes library. In this case, you can use our software to put SMS from iTunes Backup onto your iPhone/Android phone smoothly even without your old iPhone. Lastly, iPhone Android SMS Transfer + lets you easily and quickly export SMS into document files, including txt, csv, word or html, and quickly print out SMS memssages in threading mode. Fully compatible with iOS 7 and iPhone 5S/5C. Features: 1 Transfer SMS between iPhone and Android directly. 2 Save SMS from iPhone/Android onto local database on computer. 3 Restore SMS from computer to iPhone/Android phone. 4 Copy SMS from iTunes Backup to iPhone/Android phone. 5 Transfer SMS between two iPhones, transfer SMS between two Android phones. 6 Export SMS into document files. 7 Print out SMS in a few mouse clicks. 8 iMessages management supported also. This site does not contain serial number, crack, keygen iPhone Android SMS Transfer + serial number : serial number is the simplest type of crack. A serial number(cdkey,product key,etc) is register the program as you may already know. a crack or keygen may contain harmful software. If you cannot find the exact version you want, just give it a try. for more information read .nfo/.txt/.diz file include in zipped file.